Since 1987, our group has been focused on providing high-quality vision care to our patients. We appreciate your trust in us for all of your visual needs. Our experienced staff operates as a team and we are totally committed to providing you with superior service. We invite you to browse our website to learn more about our optometry services, and invite you to join our patient family by scheduling an eye appointment today. 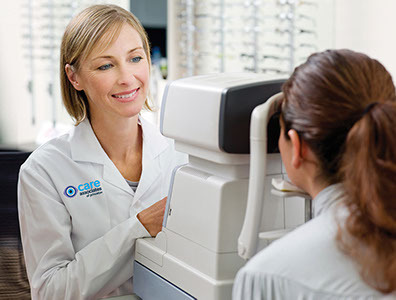 Our eye care center is conveniently located right inside of LensCrafters in the Princeton MarketFair in Princeton, NJ. Ortho-K is a non-surgical, reversible procedure to reshape the corneal surface during the night for clear vision the next day. Most patients will have an initial improvement in 1-3 days. Most individuals with allergies also suffer from eye allergies which affect millions of North Americans, particularly with seasonal allergic conjunctivitis (SAC) which is common during the spring, summer and fall. Utilizing cutting edge technology, we diagnose and manage, with greater precision, diseases like Glaucoma, Macular Degeneration, Cataracts, and Diabetic Retinopathy.